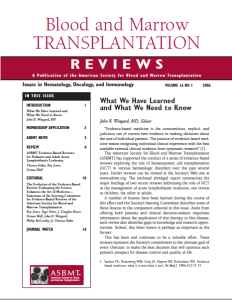 The American Society for Blood and Marrow Transplantation (ASBMT) has supported the conduct of a series of evidence-based reviews exploring the role of hematopoietic cell transplantation (HCT) in various hematologic disorders over the past several years. Earlier reviews can be viewed at the Society’s Web site at www.asbmt.org. The enclosed abridged report summarizes the major findings of two recent reviews addressing the role of HCT in the management of acute lymphoblastic leukemia, one review in children, the other in adults. A number of lessons have been learned during the course of this effort and the Society’s Steering Committee describes some of these lessons in the companion editorial in this issue. Aside from offering both patients and clinical decision-makers important information about the application of this therapy to this disease, each review also identifies gaps in knowledge and research opportunities. Indeed, this latter lesson is perhaps as important as the former. This has been and continues to be a valuable effort. These reviews represent the Society’s commitment to the ultimate goal of every clinician: to make the best decision that will optimize each patient’s prospect for disease control and quality of life. 1 Sackett DL, Rosenberg WM, Gray JA, Haynes RB, Richardson WS. Evidence based medicine: what it is and what it isn’t. Br Med J. 1996;312:71-72.